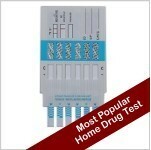 The most popular home drug tests ordered online are the 12 panel also known as a multi panel drug test and the single panel marijuana drug test. Today's drug testing technology gives you the ability to test for twelve drugs at one time for a very affordable price of about $8. This multi panel drug screen has become very popular for drug testing at home and even in the workplace because it covers so many drugs at one time for a very affordable amount. These tests are FDA cleared and are used by doctors, hospitals, companies and schools and are now available to be used in the privacy of your own home. The single test for Marijuana or a THC test is also very popular in the home market. Starting at a low price of $1.95 per test, but since it is most often ordered in quantity the price drops to $1.65 per test if you order ten. Most people order at least ten THC tests at one time. This test is very popular in the home market since many people are testing themselves to find out when they no longer have THC in their system so that they will pass a drug test at work.